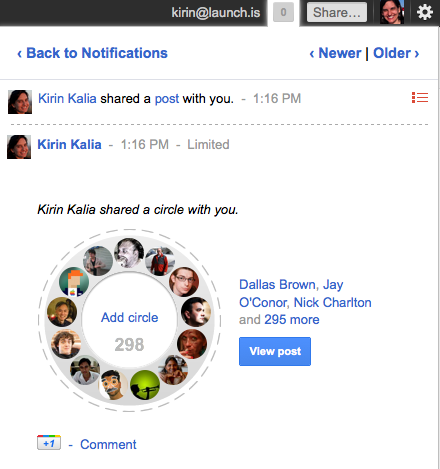 Big Question for Google+: How to Deal with Multiple Profiles for the Same Person? The launch of Google+ for Apps accounts raises a number of questions that we're not sure Google is ready to answer just yet (we've asked and are waiting). The big one: if you have a Google+ account for work (e.g., launch.is) and one linked to your personal Gmail account, how will they interact? We know a migration tool will be out in a few weeks so that power Google+ users don't have to rebuild everything. We can't believe Google didn't have this ready from day one...anyway, you don't need the migration tool to transfer your circles, arguably the most important part of your profile after your posts/photos. Once you've created a Google+ profile with your Apps account, go back to to your personal profile and add your "App self" to the list of people you follow. Next, share a circle to your App self. Now your App self can add that circle. Repeat as necessary. One tip: choose a different profile photo for your App self so you can easily figure out which profile you're working with. The follow-up questions to how these accounts interact: how many versions of people will we find when we search for them on Google+ and how will Google+ present them? For someone on the LAUNCH team with an uncommon name, a search of Google+ turned up both the personal and Apps profiles but gave no indication which was which, though the older (personal) profile is listed first. Things are going to get confusing (or interesting) very quickly. By keeping Google+ from its app users for four months, Google -- which we know really wants people to use their real names thanks to the pseudonym wars this summer -- created the problem of multiple profiles for the same individual, a problem Facebook never had. Will Google even allow us to maintain multiple profiles under the same name/for the same person? We think they'll have no choice because owners of Apps accounts -- and therefore of your Apps Google+ profile -- can access and delete anything from those profiles at any time [ Google did confirm this for us ]. Change jobs and lose that chunk of your social identity? No way. We already have multiple email accounts to separate our work and personal lives, and Google+ profiles will have to be no different. After all, no one wants their employers messing around in the guts of their Facebook account even if they use Facebook for work-related tasks (like we do). While Google is figuring out how to deal with these issues, we have a feeling the Google+ community will come up with work-arounds for identifying their App selves and personal selves and those they want in their circles. How are you dealing with your different Google+ profiles, what are your work-arounds? Share in the comments.